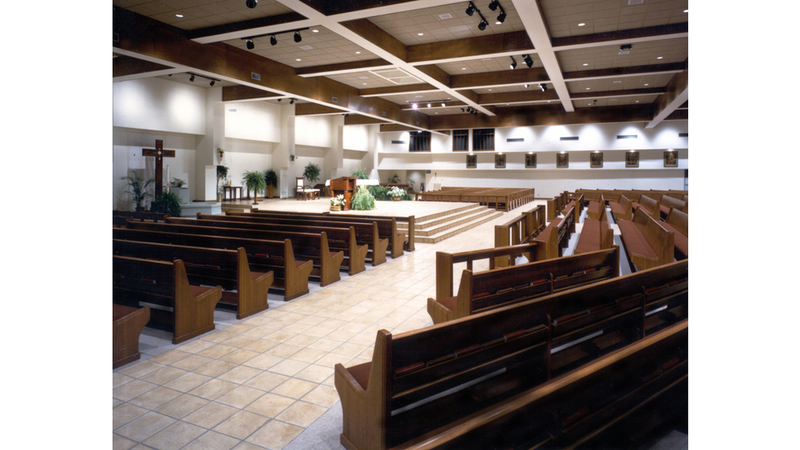 This 1994 project involves the renovation and expansion of an existing worship space. For over 30 years the parish celebrated in a structure originally designed to become a gym. For economic reasons, the renovation preserves the original structure while incorporating the requirements of contemporary liturgical worship. The original structure was wrapped on three sides to allow for a new entry vestibule and circulation, sacristy and vesting, cry room and daily chapel. The orientation of the altar was shifted to the short axis to bring the congregation closer to the celebrant. Large glass areas and wrap-around porches offer a unique indoor/outdoor relationship.